OMG... I just baked the most awesome cake ever! My son's former Au Pair (who is German) used to make this cake for us, non-gluten free, 3 years ago when she lived with us in the States and I would cheat just to have a slice. Today she is visiting us and I asked her if we could attempt to convert her mom's recipe into a gluten free recipe. So we did and WOW we cannot tell the difference one bit. This is a fantastic cake to make for Thanksgiving or Christmas dinner or just for fun anytime. 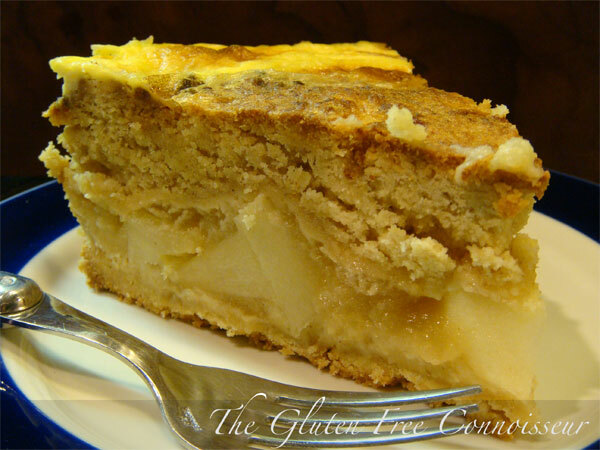 The Germans are known for their amazing apple strudels and cakes so give this one a try. Everyone will love it!!! In a large mixing bowl mix flour, coconut crystals, butter, baking powder, and almond extract together with hand mixer until mixture is crumbly. Prepare 8 or 9 inch spring form cake pan by lining the bottom with parchment paper and buttering the sides. Place 1/2 of flour mixture in the bottom of the pan. Layer the apples on top of the flour layer and the apple sauce on top of the apples. Place remaining flour mixture on top and bake in oven for 30 minutes. Meanwhile mix the cream and egg with a fork and set aside until the cake is done then pour the cream mixture on top and return to oven for an additional 15 minutes. Let the cake cool for at least 1 to 2 hours before slicing and serving. Needs ice cream. Mmmmm... ice cream.